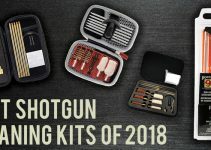 Considering we run a site about cleaning guns & gun cleaning kits we obviously get a lot of questions about what the best gun cleaning solvents are. So we went out and polled some of the best shooters & gunsmiths in the area about what their favorites are. 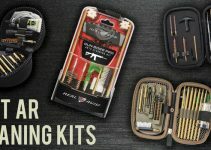 Most gun cleaning kits don’t actually include any sort of gun cleaning solvent, so you would need to purchase yours separately. There are a few commonly overlooked factors when purchasing gun cleaning solvents. If you plan on just running a bore snake through & doing a quick cleanup you’ll only need a small bit of CLP. On the other hand, a full clean will call for a few different kinds of oils & cleaners. I’ll cover the best gun cleaner lubricants and protectors, and I’ll also go over why they are the best. Bore snake kits will typically already come with both types of cleaning solvents. However if you purchased a gun cleaning kit, you’ll more than likely have to buy these two solvents separately. Hoppe’s is well known in the industry for being the best bore cleaner. As the most widely used remover of powder, lead, metal fouling, & rust Hoppe’s No. 9 is one of the best selling bore cleaners on the market. They’ve been around for over 100 years, and they’ve got making bore solvents quite literally down to a science. One of the more popular methods for cleaning firearms is to use this bore cleaner along with a CLP. Another quite popular method is to only use this solvent and forgo the CLP altogether, although you will typically find mixed feedback among purists regarding the effectiveness of that. I’ve personally been using Hoppe’s No. 9 for years after shooting trap, and I regard it as one of the best bore cleaners compared to other CLP’s on the market. For most people using the Hoppe’s bore cleaner, they simply use a boresnake. 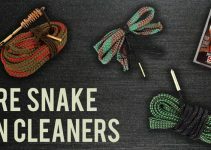 Companies don’t include boresnakes in gun cleaning kits, but they are essential for cleaning your gun quickly. After each shooting session you should use a boresnake with a dab of Hoppe’s bore cleaner. This is most commonly referred to as a “quick clean” and only takes a few seconds. You know something is well made when the US Army elects to use it to clean all rifles, pistols, and even tanks. Break Free CLP has been one of the most popular choices among shooting enthusiasts over the years. As you’ll notice, there have been almost nothing but positive reviews. Over the years we’ve taken a look at just about every gun cleaner spray. We’ve found Break Free CLP to be the absolute best gun cleaning aerosol spray on the market today. While it also comes in spray bottles, we tend to prefer Break Free CLP in an aerosol spray. The addition of the little straw on the end allows us to target individual spots without wasting a bunch of the CLP. One of the primary benefits of this particular CLP is that it has a very high weather tolerance, so it works in practically all conditions. Sage & Braker knew exactly what they were looking to do when they named their product. CLP stands for Clean, Lube, & Protect and this solvent does exactly that. If you ask around at your local gun club, I would be willing to bet that half of the people there use this Sage & Braker solvent. Aside from smelling great (I’d rank it up there with the smell of gunpowder) it cleans incredibly well. People have commonly noted that this solvent cut their gun cleaning time in half. If you’re using CLP by Sage & Braker you’ll notice that this gun cleaning solvent works perfectly with a bore snake. Looking for a full clean? Go ahead and use it on brushes as well and you’ll be just as happy! A major selling point of this solvent is that it has been specifically designed to prevent from attracting dust like so many other CLP products do. I’m not exactly sure how they do it, but I will say that it is noticeable & it works! No harsh smelling chemicals that will not damage the blueing and finish of your well-loved firearms. Non-Hazardous, biodegradable and non-toxic, so you can feel good that cleaning your firearms isn’t damaging your loved one’s health or our environment. Normal CLP’s oil can attract dust and sand. With this in mind, we went to work on the most effective CLP to come to the market that significantly reduces adhesion of debris to your firearms surface. Our CLP coats and protects the bore and all moving parts on your firearm. It also provides working components of the firearm improved heat dissipation resulting in cooler weapon operation temperatures. Our formula enhances a complete burn of the powder in your cartridge, creating a more consistent FPS and therefore a more accurate shot. The aggressive cleaning of our Clean, Lube and Protect will remove crud from your firearms after years of neglect, all while not using harsh chemicals that can poison those that use it. Between Break Free & Billistol it’s been a battle for the best gun cleaner spray. 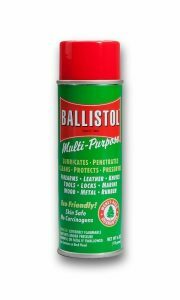 The Ballistol multipurpose spray gun cleaner was actually developed for the German army over 100 years ago. German scientists & engineers went to work developing a formula that would be a universal gun cleaning formula for all sorts of weapons. Considering Germans are considered to have some of the top engineers in the world, it isn’t any surprise that Ballistol may very well be the best gun cleaning solvent ever designed. Shooting enthusiasts everywhere have been using this formula since its conception, and many swear that this solvent is the best gun cleaner spray. Ballistol has been known to not only clean firearms, but also clean knives, boots, packs, engines, & so much more. It’s a very well rounded gun cleaning solvent. We’ve seen plenty of cans of Ballistol gun cleaning spray floating around the trap club. It is also designed to be non-toxic and has a pleasant smell, unlike some other gun cleaner sprays. If you ever hear anyone talk about Slip2000, you’ll hear only good things about it. It’s well known for working great in extreme weather conditions, & I personally use it on my Benelli Super Black Eagle III shotgun during pheasant season in freezing temperatures. As I mentioned above, Slip2000 is rated for extreme weather conditions, so it’s the best option if you’re going to be in very cold or hot climates. Aerosol canisters are well known for not working well in extreme cold, so that rules some CLPs out. Often times these gun cleaning solvents will also gel up and make your gun almost impossible to clean. Another nice feature about the Slip2000 is that it is small enough to fit well into most hard-shell gun cases. Many shooters around our trap club keep a bottle in their gun cases year-round in case they need a quick gun lube. It’s one thing when you’re at the shooting club plinking targets, but when it comes to deer hunting scent control is incredibly important. That’s why they turn to Lucas Gun Oil, as it is an odorless CLP that is designed to prevent jamming and overheating in larger caliber rifles. Simply dab a couple of drops on the bolt of your pistol, long rifle, or AR and you’re good to go. You won’t need much, and just like most CLPs it will last you a long time. This is a great, inexpensive option for gun owners. However, you should be sure to note that this is not specifically a CLP. You should only be used for lubricating your firearms after you’re done using your CLP to clean it. Since this is simply a lubricant many shooters decide to use Hoppe’s No 9 gun cleaner for cleaning and then use Lucas Gun Oil to lube their firearms. When you’re asking around about what the best gun cleaning solvent is, it’s only natural to also ask what the best gun cleaning oil is. A lot of the competition shooters that we talked to at the range love the M-Pro7, and find it works really well alongside the M-Pro bore snake. We’ve used both their oil and protector for a few years on our pistols, and we’ve been pleased with its ability to work well in most weather conditions. One thing that we definitely noticed (and it appears we aren’t the only ones) is that the bottle isn’t a great design. We’ve had the bottle leak all over our gun cleaning kit when it isn’t stored right side up. Needless to say, this was less than desirable. While some have noted that you could simply tighten the cap better, I’m not so sure. 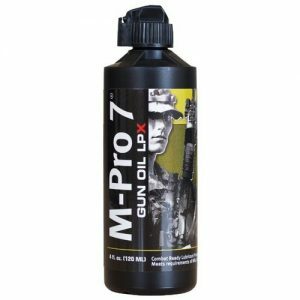 While the M-Pro7 is a great actual gun oil, it is best left at home on the workbench. As Amazon’s #1 Pick for the best gun cleaner lubricant, it would be irresponsible not to include Hoppe’s No. 9 on this list. One of the first features you’ll notice is that they’ve included a childproof lid. As someone who recently became a new dad, I can say that this alone is a selling point. Aside from the childproof lid, this gun cleaner lubricant is an incredible product. One of the most common CLP combos we’ve found has been this alongside the Hoppe’s No. 9 Gun Bore Cleaner. Having been around so long, Hoppe’s has developed a large variety of gun cleaning solvents. They are one of the most trusted brands in the industry, and they’ve certainly earned it. 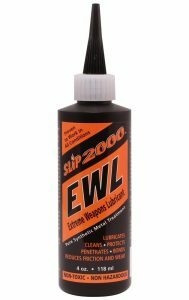 One thing that makes this particular gun cleaning lubricant so popular is that it is a synthetic CLP. While many people swear by non-synthetic CLPs, it is very clear that this formulation is one of the most effective on the market. Gun grease is used to prevent corrosion that can build up during long-term storage. You’ll commonly find that most metal parts have a light coat of grease on any new firearms you purchase. Normally if the gun is in the original box you’ll find that it has been greased by the manufacturer. A little-known fact is that most display guns on the shelf are actually degreased by the gun store. This gives people testing the firearms a cleaner, more positive first impression. This Tetra grease is designed to help protect your gun for long-term storage. It’s colorless and is meant to be rubbed on your gun before you store it away for the season. One thing to note is that it definitely has a strong odor, but the smell does fade after a day or two. Gun grease is recommended over gun cleaning oils for long-term storage. The main reason for this is because gun oils will dry up or harden over time, which can end up damaging your firearm. With grease, you don’t have this problem & you can store it for years without issues. Once it’s time to take the gun out to shoot again, it is recommended to degrease it & give it a good clean with a CLP. Think of the grease more as a preservative, not a lubricant. This is a bit more of a niche product, but many people like to include a needle oiler in their gun cleaning kit. While it was a tough pick between Pro-Shot and Hoppe’s, we opted with this one. I would actually consider it pretty even with Hoppe’s, but we didn’t want to make this a list a full catalog of Hoppe’s products, so here we are. Pro-Shot’s needle oiler CLP is slightly cheaper than Hoppe’s (as of this writing). One nice feature that we noticed was that Pro-Shot’s CLP is actually a red liquid, which is actually kind of helpful to be able to tell if you’re hitting the right spot or not. A major benefit of a needle oiler is that you can actually use the needle to scrape/clean hard to reach spots in your gun. Obviously, you don’t want to get out of hand with this, but it’s certainly helpful. Even after the CLP is gone we tend to keep the bottle & refill it with any other gun cleaning solvent they have on hand. Trust us, we totally get it that it can be confusing when you’re trying to pick a good gun cleaning solvent. There are so many options and variations out there that it gets to be mind-numbing just to differentiate the two. Hopefully, our little top 10 list answers most of your questions & helps you make some good buying decisions. While a bottle of gun cleaning solvent probably won’t break the bank, that $1,200 gun you’re lubing up certainly will. Take good care of it and keep it clean, and you’ll be handing down a pristine firearm to your kids someday. When you’re cleaning your gun you should always make sure it is secure & isn’t going to slip out of your hands or off your tool bench. A best practice is to use a gun vise to secure it. We get that it might seem like a little bit of overkill, but the last thing you want to do is ruin the finish on your gun from simply cleaning it. Leave the scratches and scrapes for stories in the field, not from fumbling & bumbling during a cleaning session. Another great practice is to use a good gun cleaning mat. This will help you save your surfaces, and to keep from accidentally transferring your gun cleaning solvents to you next project. There’s nothing worse than having CLP everywhere & not being able to tell where it is coming from. Not sure what cleaning mat is the best for you, check out our favorites here. For the Love of God, Don’t Let Them Leak! A spilled bottle of gun cleaning solvent or lube can very easily ruin a gun case, table – you name it. We try to point out which bottles to be be careful with, but always be sure that your CLP cap is screwed on extra tight. Storing bottles right-side-up is always a good idea as well. Another great idea (especially for travel) is to find some great little bottles that you know won’t leak. You can transfer some of your gun cleaning solvent into these bottles & store them in your gun cleaning kit. Just be sure to label them clearly so you know what is in each bottle! If you’re planning on going on a hunting trip to Africa, you likely wouldn’t base your buying decision on something that performs well in the cold. Knowing what kind of weather you’ll be shooting in & planning accordingly will put you in the best possible position for success. Many of the gun cleaning solvents we listed have been proven to work very well in extreme weather situations, but you’ll still want to verify that for yourself. Some solvents have a wheelhouse at different temperature ranges and conditions. As I mentioned above, some of the solvents are actually being designed to work well on large caliber rifles and even machine guns. With this in mind you might decide to use a certain type of CLP for your AR or pistol. However ,that same CLP might not be best suited for your black powder muzzle loader that you’re going to fire once during gun deer season. Knowing which gun cleaning solvent to use for each scenario can really go a long ways. Each of your guns was likely a significant investment for you at the time you purchased it. Many shooters end up saving months or even years to buy a specific make & model of gun. Well you want to protect that gun from all the elements and make sure that it is in top condition for years to come. That’s exactly what gun cleaning solvents are there for. Like any other industry, some solvents are better than others & others are meant to serve more specific purposes. We went out of our way to provide a little bit about what differentiates every solvent on our list. This way you can make the most informed decision possible. We certainly have our favorites, but our goal was to keep that out of each of the descriptions so that you can make your own decision. Keeping your firearm clean & ready to go by using a good cleaning solvent is one of the most important things you can do. Making sure you clean your gun regularly with a proper gun cleaning kit is going to be the biggest factor in the lifespan of your gun. When storing your guns you need to make sure you are preventing moisture buildup and condensation. As everyone knows moisture can cause firearms to rust within a matter of days. Be sure you’re storing your gun in a dry location. Making the Call: What’s the Best Gun Cleaning Solvent? There’s nothing worse than reading through a Top 10 list only to find the author didn’t ever pick their favorite. Well, we weren’t about to let that happen here! We polled our team of competitive shooters & the results were almost unanimous. Just about every one of our shooters chose Hoppe’s Bore Cleaner as their top pick. They had all been using it for years, and have struggled to find anything better. It’s important to note that you should use Hoppe’s Bore Cleaner in combination with other solvents since it’s not technically a CLP. However, it is definitely the best bore cleaner on the market. 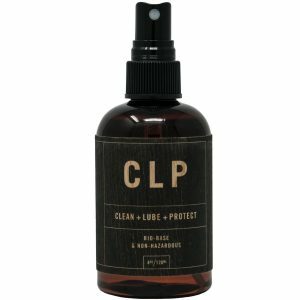 There were a few people that use it exclusively on their guns without issue, but most of us also prefer a CLP spray after using the bore cleaner. Our choice for the best aerosol gun cleaner spray was Break Free. I’ve been using it for a few decades now, and I’ve never been disappointed. As with most gun cleaners, a single can of this aerosol CLP spray will last you years. Using the best gun cleaning solvent is critical if you expect your guns to perform at peak performance. Basing your decision solely on brand name is almost never a good idea. It’s important to know exactly what you’re expecting of your CLP. Hopefully, you got some good insights out of our article about the top 10 gun cleaning solvents. Heck, maybe you even learned a thing or two. While we certainly have our favorites, it’s important to note that there really isn’t an “all in one” pick that we’d recommend. Spend the extra $10 and grab the right combination of solvents. Your firearm will thank you for it in years to come.